The Syrian Refugee Crisis is not only a problem for residents in Europe and the Middle East; it is a problem for all members of the global community. The Syrian Refugee Crisis has become an issue in Europe and the Middle East because the war has created a massive influx of refugees who need food, shelter, and medical help. The crisis is a problem for the broader global community because all people have a duty to take care of each other, while also ensuring the health and safety of our communities. What are we to do when some nation-states/countries want to welcome a refugee and others are fearful the refugee might be a wolf in sheep’s clothing? This three-part series will explain the cause of the Refugee Crisis, the current stance on the situation, the process for Syrian Refugees seeking asylum in the United States, and finally, what we can do to welcome refugees while also ensuring our local health and safety. 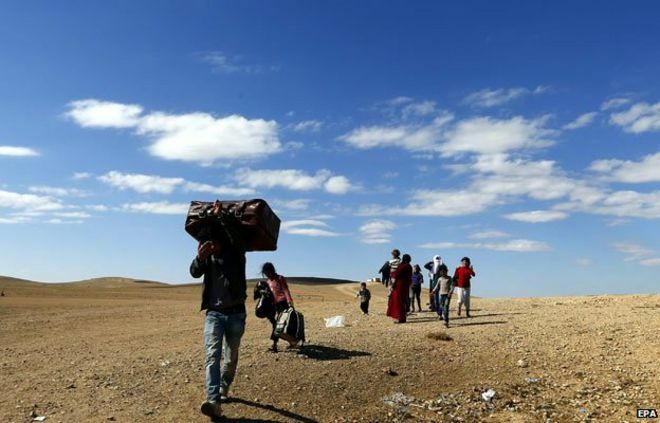 As with any crisis, there are several contributing factors to the Syrian Refugee Crisis. First and foremost is the civil war that has been raging on in the country since 2011. In the past five years, 11 million Syrians (roughly half of the Syrian population) have been killed or displaced because of the civil war. Currently, there are 4.8 million Syrian refugees in the world. While most of those fleeing the country have sought sanctuary in Lebanon, others have fled to neighboring countries like Jordan or Turkey. Other contributing factors to the crisis include Germany’s promise to accept asylum seekers, Syrian President Bashar Al-Assad’s conscription of practically all men under 30, and the underfunded international effort to address the situation. Currently, the EU has taken steps to quell the Refugee Crisis by making a relocation deal with Turkey. The EU and Turkey reached an agreement where Turkey will take many of the refugees in Europe and secure its western border in return for $7 billion from the EU. The EU started a pilot program where it will give Syrian refugees pre-paid Visa debit cards worth $30 a month. The hope for this program is that it will help fuel the local economy and meet some of the needs of refugees both in and outside of established refugee camps. It remains to be seen if and how this pilot program will be successful. Where are the refugees going? The vast majority of Syrian refugees remain in the Middle East. They are in Turkey, Lebanon, Jordan, Iraq, and Egypt, while roughly 10 percent have fled to Europe and far fewer have made their way to the United States and Canada. For those in the Middle-East, many live in refugee camps with worsening conditions, but many others live discreetly in urban centers, working odd jobs and trying desperately to make ends meet. With no end in sight for the Syrian civil war, the refugee crisis will only get worse before it gets better. The temporary solutions the surrounding communities pieced together to address the emergency influx are becoming unbearable permanent situations. The global community must find a solution addressing both the symptoms and the causes of the refugee crisis. Whether living in a camp or in a city, many Syrian refugees are applying for asylum in Europe and North America. However, only a select few are chosen to resettle in the United States. How are they chosen, what screening processes do they go through and what happens to them when they arrive in the U.S.? These questions will be explored in the next two articles. David Coats is a staff editor on the Denver Journal of International Law & Policy.